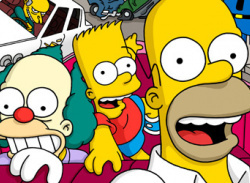 The Simpson’s go Crazy taxi but it is a shameless cash-in or good game? The Simpsons Road Rage blends renowned Simpsons wit and edge-of-your-seat racing action into a rip-roaring, reckless and riotously-funny arcade-style driving game. Mr. Burns is up to his greedy ways again, purchasing the Springfield Transit Corporation and jacking up the fares. 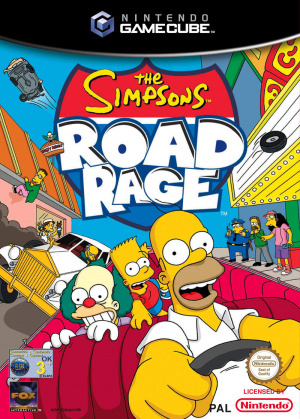 Refusing to shell out the high rates, Springfield citizens are forced into humorous "road rage" as they brave angry commuters, jam-packed back-routes and the challenge to make enough money to buy back the Transit Corporation before time runs out. No time for donuts, Homer. Over 25 Simpson characters, featuring voices, animations and unique relationships with other characters, are behind the wheel or wandering the streets of Springfield begging for a ride. Wreak havoc in 5 Springfield neighborhoods featuring over 100 Simpsons landmarks. Bonus system rewards players of all skill levels and lets players choose which characters and cars they want to unlock. Interactive worlds provide an intensely busy community environment alive with traffic and pedestrian interaction that adds to commuters' road rage. Two-Player split screen action lets players beat opponents in a race for the next passenger, or steal their passenger mid-ride! Jumps, powerslides, and speed-starts are all done with a simple arcade-style 3-button interface. Cruise through a variety of terrain including hills, jumps, mountains, forests, and timesaving short cuts. Story Mode allows for 40 to 60 unique passenger deliveries, plus seven mini-bonus deliveries. Sunday Driving Mode lets players pick up passengers and explore the city at a leisurely pace. Radical Toon RendererTM technology provides authentic Simpsons animated look.